SQL Server Management Studio aka SSMS is the default integrated graphical user interface tool that is used to access, administrate, configure, manage, query and monitor the different SQL Server instances that are hosted locally at the user machine, remotely on a server or anywhere in the cloud. It is a comprehensive environment that allows us to edit, debug and deploy scripts written in different languages such as T-SQL, DAX, MDX, XML and more. In my previous articles, we followed the enhancements to the existing SSMS features, the fixes to the bugs found and reported in the previous SSMS versions and the new features added to each new release. These new features that are introduced in the previous versions include the Connections dialog box new options, the embedded Performance Dashboard, Showplan node search, Import Flat File Wizard, the XEvent Profiler and Always On Availability Group dashboard new additions, which are described deeply in these articles. Recall that, starting from SQL Server 2017 version, the SSMS versioning track is separated from the SQL Server Engine versioning. Where SQL Server 2017 has version number starting with 14.0, but the SSMS assigned version number starting from 17.X. 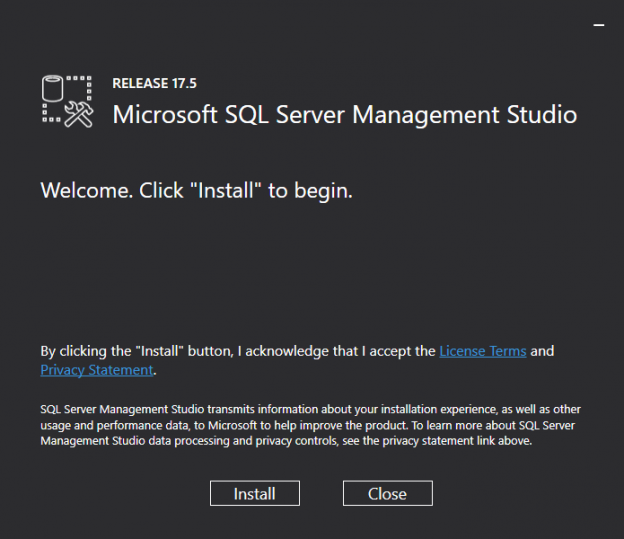 In addition, starting from SQL Server 2016, Microsoft SSMS tool installation media is separated from the SQL Server Engine installation media, that requires you to download it from the Microsoft Download page to install it to your machine or server. SSMS 17.5 provides full support for all features on SQL Server 2008 version through the SQL Server 2017 latest version and the latest cloud features available in Azure SQL Database and Azure SQL Data Warehouse, with the ability to connect to SQL Server instances installed on Linux servers using SSMS 17.5 version. SSMS 17.5 comes also with two major enhancements to the existing features. The first one is related to the Query Editor that allows us to skip a specific number of rows when loading a delimited text files into the Azure SQL Data Warehouse using the SkipRow option of the Delimited Text External File Format. The second enhancement in that SSMS version, is related to the ShowPlan feature, that enhanced by enabling the display of the Estimated Plan button for the Azure SQL Data Warehouse. SSMS 17.5 comes with one new valuable feature, the Data Discovery and Classification feature, that we will describe deeply in this article. The 17.5 version of SSMS introduces a new SSMS built-in security tool with a set of advanced services, that is used to scan, discover, classify, label and report the sensitive data in the database. These sensitive data include business, financial and healthcare information. The Data Discovery and Classification tool helps us protecting our data, by meeting the data privacy standards and controlling the access to such data. This feature also helps us in the Data Compliance process by meeting the regulatory compliance requirements and generate reports for auditing purposes. Using the Data Discovery and Classification, the classification engine will scan the database in order to identify the list of columns that contain potentially sensitive data and provide you with that list in order to review it and apply the recommended classification, or manually apply your own customized classification policy. After that, these classification attribute labels will be tagged on the columns that contain sensitive data, and then can be viewed with the database classification state in a detailed report, with the ability to export or print it for different purposes such as auditing purposes. The previously generated report can be easily exported to PDF, Excel or Word format or printed directly as an auditing or compliance evidence. It is clear now how the SQL Server Data Discovery and Classification feature is useful in identifying the sensitive data stored in your database as the first step in securing and protecting the company sensitive data, taking into consideration that this needs your touches in classifying the rest of columns that contains sensitive data, but the names of these columns are not chosen well to indicate the type of data stored in these columns. Enjoy this new feature and stay tuned for the new SSMS releases!